Kaitlyn the cowgirl is a 6" articulate Western Rider doll that comes dressed to show in a flashy pink show shirt, tan chaps and pants, and tan hat with pink band! 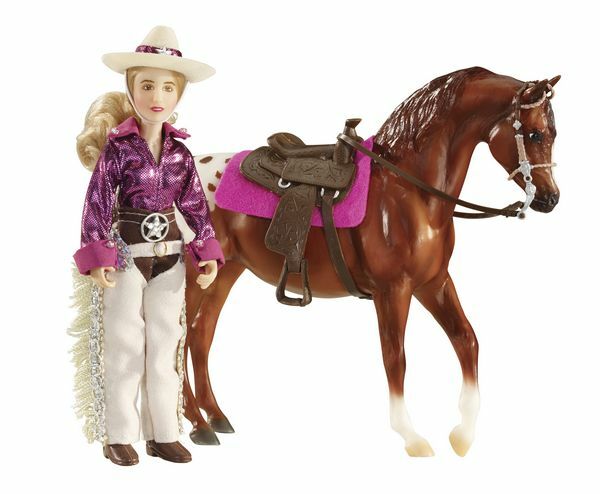 Breyer's Kaitlyn Cowgirl Rider Doll Set also includes a Classics Size Western saddle and bridle, and pink saddle pad. The horse tack is designed to fit most Classics Size model horses. Breyer Classics Size Horse not included.